Preheat oven to 450 degrees F. Place tilapia on a foil-lined baking sheet. Spread 6 tablespoons of the hummus over top of fillets. In a small bowl stir together walnuts, panko, dillweed and salt; stir in remaining 2 tablespoons hummus until combined. Spoon over fillets, patting lightly. 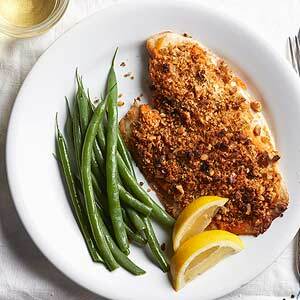 Bake for 4 to 6 minutes per 1/2-inch thickness of fish until fish flakes easily with a fork. Serve with lemon wedges.